In Shaker teachings, self-sufficiency in manufacturing is important, and I felt the modern version is making things with familiar materials that are easy to obtain. I wanted to suggest something new with a combination of existing materials rather than focusing on new materials. To make a basket, I cut a pattern from carpet tile, which is mainly used in offices, drilled holes and sewed the pieces together with zip ties. The outside appearance has a heavy-duty feeling, but the inside is a soft carpet material, so it can be used for holding laundry or other items. The pattern was cut out from a threaded vinyl sheet, typically used as a rain cover. We then made slits with a cutter, inserted packaging paper bands into the slits and knit a basket. 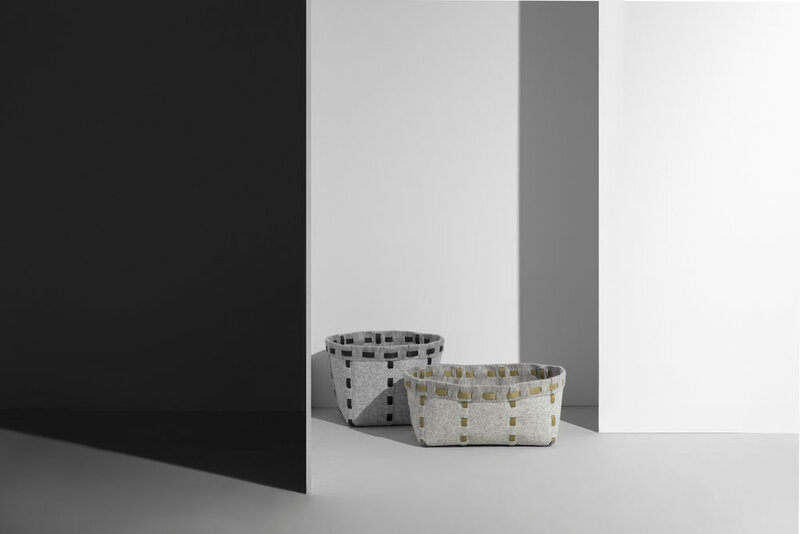 This basket is transparent, which adds visual interest by displaying the contrast between the color of the paper band and the color of the contents inside. The pattern of this basket is cut out from needle punch carpet. It is assembled together with paper bands. The shape of the bottom is square, and the shape of the opening is oval. This basket is conscious of the shape of a Shaker basket. Shigeki Fujishiro left the acclaimed IDÉE Co Ltd in 2005 to found his own studio, Shigeki Fujishiro Design. He has been active in a broad range of areas, including interior products and exhibit installations. Fujishiro typically focuses on interior products and furniture, working hard to achieve designs that are extremely elementary and have universal appeal. Fujishiro has recently collaborated with such well-known brands as Hermès, Adidas and CAMPER, as well as producing his own self-initiated projects. Fujishiro was one of 16 designers who participated in 2016 in an international project commemorating the 400th anniversary of Arita ware.